There’s probably lots of Minnesotans who have no idea the Winnebago ever lived here. Unlike the Dakota and the Anishinaabe, this was not their home land. Like many indigenous nations, they kept getting pushed westward as settlers encroached on their lands. Only seven years after this move, the Dakota-U.S. War broke out near New Ulm, about 30 miles to the west of Blue Earth County. Following the war, Rumors started that the Winnebago participated in it. The story was likely an easy sell; prejudice and hatred of Indians was part of the country’s ethos. One noteworthy act of the Mankato [Knights of the Forest] lodge … was the employment of a certain number of men whose duty it was to lie in ambush on the outskirts of the Winnebago reservation and shoot any Indian who might be observed outside the lines. Following the war, the Mankato Record newspaper launched an “extermination or removal” campaign against both the Dakota and the Winnebago. William Windom, a Congressman representing southern Minnesota, introduced a bill in Congress to remove the Winnebago. (The city of Windom in southwestern Minnesota is named after him.) Minnesota U.S. Sen. Morton Wilkinson, who lived in Mankato, carried the bill in the Senate. While the Winnebago had nothing to do with the war, they were expelled from the state of Minnesota Feb. 21, 1863; the Dakota Removal Act passed 10 days later on March 3. Both were sent to the desolate area known as Crow Creek, South Dakota. The Winnebago Removal Act provided both for relocating the Winnebago and selling their lands. According to Lass, in the spring of 1863, the Commissioner of Indian Affairs feared “collision and possible bloodshed” among the white settlers because they all wanted to begin spring planting on patches of ground the Winnebago already had cleared and cultivated. 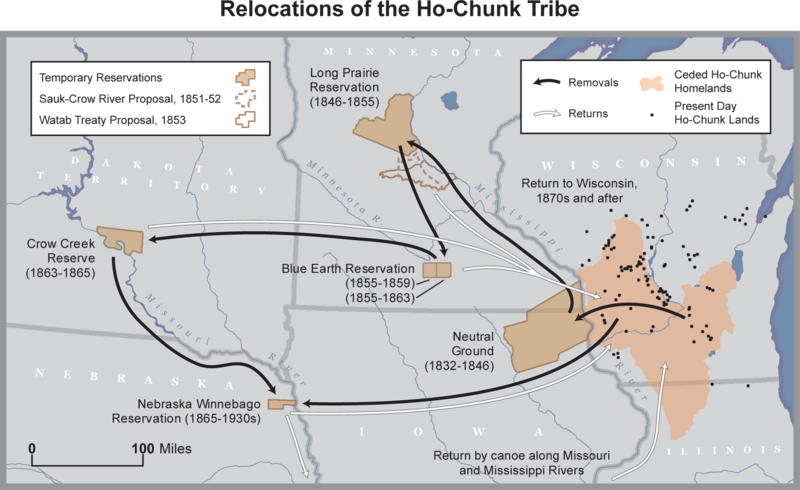 Mnopedia’s entry on Ho-Chunk and Blue Earth County, 1855-1863 tells what happened next. On April 25, 1863, the Ho-Chunk were notified that they would be moved to a barren tract of land along the Missouri River in Crow Creek, South Dakota. A small group applied for citizenship to avoid removal but was denied. Many others resisted the government’s orders and refused to leave. In early May, under threat of military force, over two thousand Ho-Chunk were moved to Camp Porter in Mankato and from there to Crow Creek. More than 550 Ho-Chunk died during their removal to South Dakota. The move to Crow Creek was a disaster. Even though the Winnebago Expulsion Act said the Winnebago were to get “a tract of unoccupied land … well adapted for agricultural purposes” it was another broken promise by the federal government. Some Winnebago moved to a reservation in Omaha, Nebraska. Others found their way back to their homeland in Wisconsin. Note: An earlier version of this blog had an incorrect date for the hanging of the Dakota 38. ← For Indigenous Peoples, Is Full Participation in “We the People” Progress or Assimilation? It is important to understand and note this because December 26, 1862 is a very important date to the Dakota people and their friends, and when it is mentioned, it is with deep respect and sadness. Furthermore, knowing the exact date would help the reader to better understand the sequence of events that led to the expulsion of the Winnebago (Ho-Chunk) from Minnesota. Thank you for the article. It opened my eyes a little more to understanding this sad and important piece of US history. What a horrid Country/State we were and still are in many ways. I’m an enrolled member of the Winnebago Tribe of Nebraska. I wanted to make it a little more detailed that we are not currently at a reservation in Omaha, Nebraska. The Omaha Tribe of Nebraska sold the Winnebago some land for the Winnebago to live and what is now the Winnebago Indian Reservation. It is located about 80 miles north of Omaha, Nebraska and just north of the Omaha Tribe of Nebraska’s Omaha Indian Reservation. Others found their way back to their homeland in Wisconsin. This Winnebago is now called the Ho-Chunk Nation of Wisconsin.